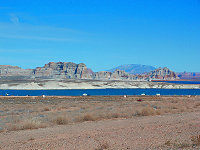 These sights are self guided and provided as suggestions on where to travel to experience and photograph the natural beauty of the Lake Powell area. If you need a guide, we can point you in the right direction for an experienced and knowledgeable person to accompany you on your journey. Always have extra water available. Summer months can be hot and exhausting. Many areas are remote with no cell service. Alert others of plans before you leave. Winter can bring snow and ice. Have warm clothing and covers available. Bring a compass and map always. Some areas are easy to get lost in. 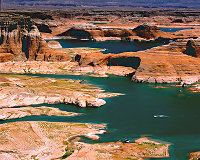 Alstrom Point is an amazing overlook point on Lake Powell from the top of the cliffs. Offers outstanding photography in late afternoon and sunset. Sunrise may also offer some great shots. During the drive you will also see some nice shots along the way. When you arrive near the point you will be offered many different overlooks for a wide variety and angles of your choosing. Alstrom Point is truly a photographer's dream. Notes Four wheel drive is required during the second half of the trip. Pavement ends at Bigwater. During rain, the creek crossing near Bigwater may become impassable and some of the trail will be slick with clay. Plenty of places to camp for overnight trips. From colorful, sheer-walled ravines with convoluted walls, to tiny hoodoos and innumerable other intricate forms, Blue Canyon offers a wide variety of photo opportunities. The red is mixed with white in many ways, from sharp, linear boundaries between solid patches, to thin strips and patterns in otherwise solid color. Much looks man made, but be assured it is all natural beauty. Notes May encounter deep sand so four wheel drive is recommended. Located on Hopi Reservation which suggest a permit and accompanying guide. Approaches from the south will have a 1/2 mile hike. 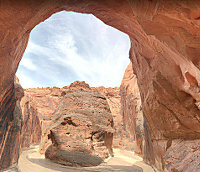 At a towering 150 feet tall and 100 feet wide, this colossal double arch is simply breathtaking and jaw-dropping. Dramatic images of this gigantic complex are best taken in early morning with the sun on it's face. Great towering shots against the sky from the base. Grosvenor Arch has a yellow hue with pink speckles offering shots reminiscent of a massive sandstone castle from afar. Notes Four wheel drive is required. High winds possible so be careful near the edge. Simple trail with no real obstacles. Free roaming area. Experience a swirling, thin-layered strata with adjacent layers of contrasting color and curious erosive features known as White Pocket. 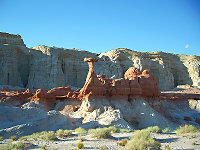 Contrasts of white rock in smoothly rounded mounds and cliff edges, dotted with two 30 foot tall imperial looking spherical beehives rock cones. In addition, experience wave like pink, yellow and white candy striped rock faces. Notes Four wheel drive is required. Free roaming area. To date, we haven't been to any place in the world as remarkable, serene, and uniquely beautiful as The Wave. One of the most highly sought hiking permits in the American Southwest. Appearing as rippling sand dunes frozen in the Arizona rock, The Wave has a remarkable undulating appearance, with massive sandstone structures stretched like taffy and cinnamon color strata domes. Notes Managed by the Bureau of Land Management, only 20 permits per day are issued. 5.2 mile round trip hike. With a vertical opening height of 85 feet and a span of 55 feet, White Mesa Arch is one of the natural attractions on the Navajo Indian Reservation. Amazing sunrise shots can be taken giving this commanding arch a beautiful reddish glow. Well worth the .8 mile loop to see this spectacular monument. Notes Four wheel drive is required. Permission from the Navajo Nation and guide recommended. Easy to get lost on the many sand roads. Great spot to camp right on the water. No designated camping spots, just park where us wish. Many 4wd/atv trails leading from this area. Boat launch is very nearby allowing you to beach your boat at camp. Small watercraft may be launched from beach. Beautiful morning and afternoon photos can be taken of the lake and surrounding red sandstone cliffs. Stellar sunsets for some great memorial shots. Notes 2wd car OK, but some areas have deep sand. Beach camping OK. Free roam area. Restrooms available. RV grey/black water dumping facility. Just a short 40 min drive from Page, AZ to the parking area. Then an easy trail to follow less than a mile to the main attraction. 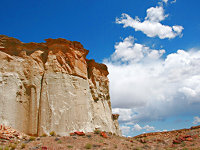 You will see smaller hoodoos and other fascinating sights on this trail along a wash surrounded by beautiful sandstone cliffs and high feature rock formations. Great place to hike around to get some shots of nature. Notes Free roam area. Camping is permitted but a suitable campsite is not easy to find. No RV spots. One of the lesser known attractions near Page, AZ. Shame in Stud Horse Point has so much beauty to offer but is short on visitors and only a few minutes away. Late afternoon and sunset offers some of the most amazing and surreal shots of Lake Powell and it's many towering rock formations. On the way to the point you will see many photogenic formations such as hoodoos, unimaginable rock formations, and towering sheer red sandstone cliffs. Notes Four wheel drive is required. Free roam area. Cliff edge is unstable so be careful. PLEASE DO NOT DEFACE ANY STRUCTURES OR THE SURROUNDINGS. LEAVE THESE BEAUTIFUL MONUMENTS THE WAY NATURE CREATED THEM!